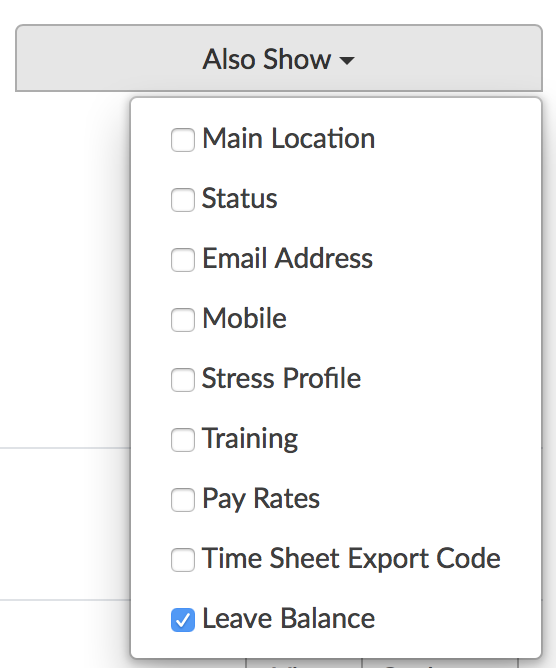 This allows you to export leave balance from selected payroll systems, and how to view accrued leave for an employee. Leave Balance can now be recorded in Deputy. This allows you you to track the amount of Leave your employees have accrued, as well as deduct leave as necessary. Leave Rules dictate how different types of leave are calculated. 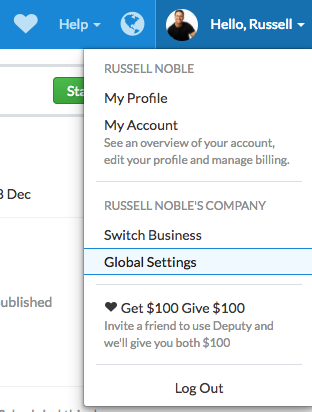 To configure Leave Rules, head to the top-right drop-down box and select 'Global Settings'. Click on the 'Leave' tab, then click 'Leave Rules'. Here you will see different types of Leave. These are the different types of leave configured into your system. 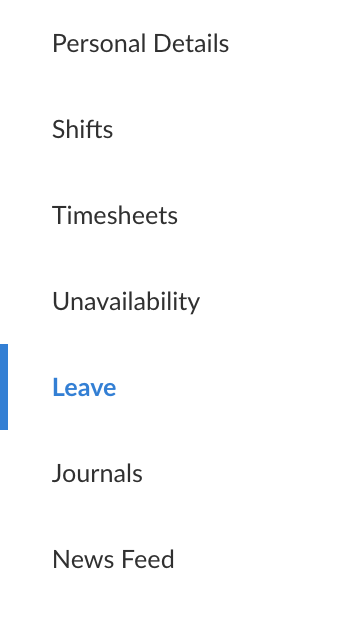 You may add additional leave types by clicking the 'New Leave Condition' button. Leave balance accrual and deduction can be manually entered via a number of ways. Accrual and deduction can also be automated so that you can set it up and leave it without having to worry about manual data entry. 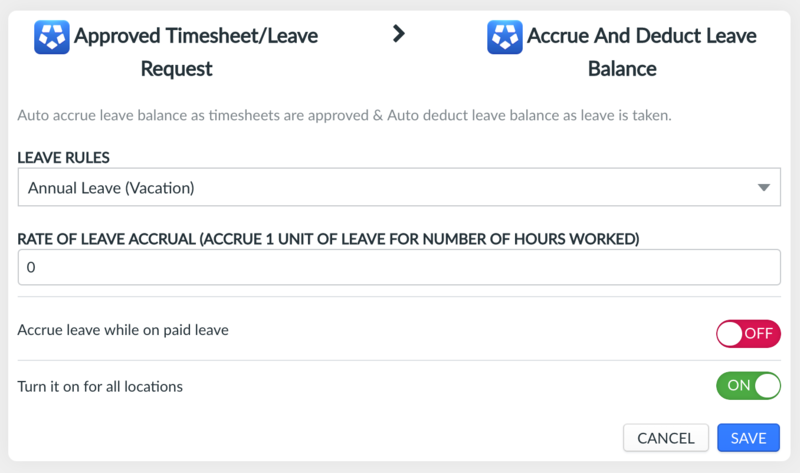 Please note that this extension handles accrual AND deduction of leave balance from approved timesheets. First, head to the location you would like to apply Leave Accrual to and click 'Edit Settings'. 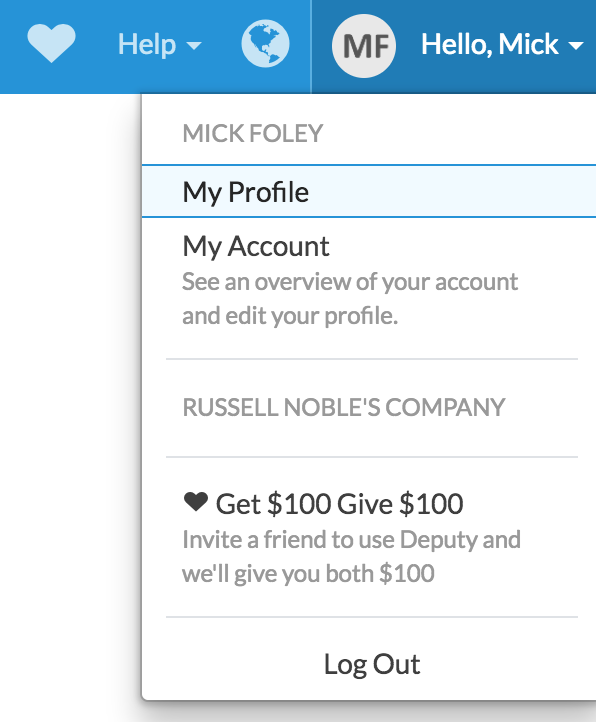 Click on the 'Notifications & Integrations' tab, then select Deputy. Search for the 'Approved Timesheet/Leave Request > Accrue and Deduct Leave Balance' option, then click Activate. From here, you can set the rules of the extension. Remember to click 'Save' when you are done. Navigate to the People page and click 'View' on the employee you would like to add/change leave balances for. 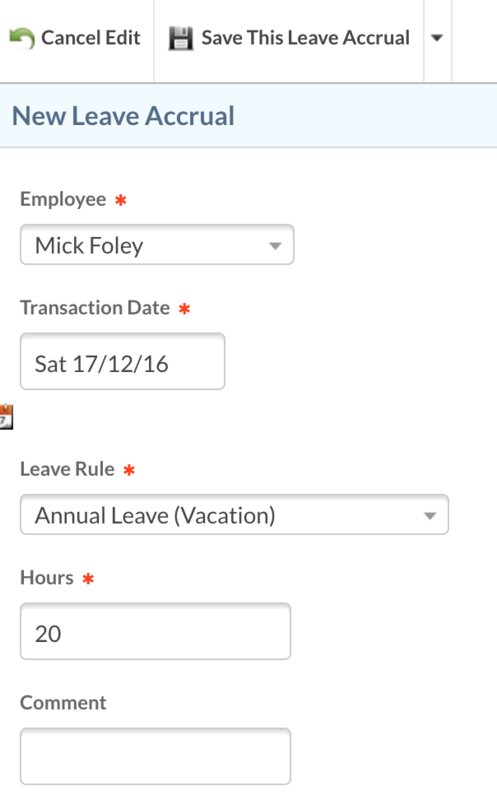 From here, you can manually enter in the values corresponding to the amount of leave the employee has for that leave type. 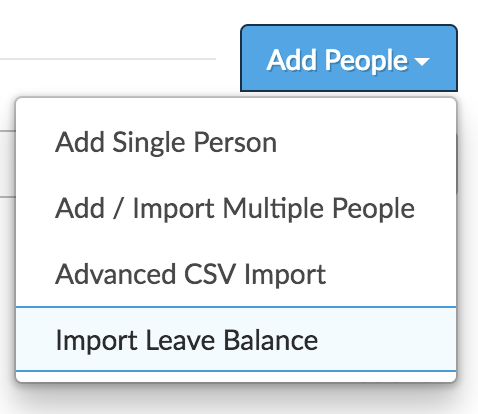 You can now bulk import leave balances via the People page. To do this, navigate to the People page and click the 'Add People' drop-down box. Simply click 'Import from Excel/CSV' in the modal that appears to begin. Alternatively, you can drag and drop your desired file into the modal. For a sample leave CSV file, click here. To do this, you will need to add the function from the Integrations page. First, navigate to the Locations page, and click 'Edit Settings' for the location you would like to modify. 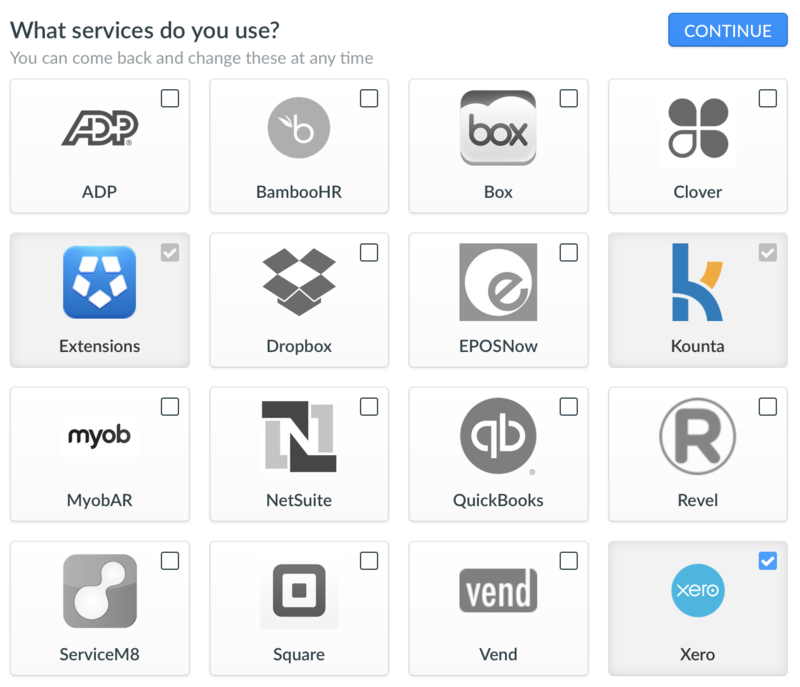 Now click the 'Integrations' tab and select the payroll/HR solution that you are using. In this example, we'll use Xero. Click 'Continue'. Please note that if you do not initially see a list of services, as seen in the screenshot below, you may need to click 'Edit Services' to see this screen. Now scroll down to the Xero integrations until you see 'Import Leave Balance > Sync Leave Balance'. Click 'Authorize' if you need to log into your Xero account. Otherwise, click 'Activate' to setup the integration. Now, simply click 'Save' to continue. You will be brought to the following page. To add a new Leave Accrual, press the 'New Leave Accrual' button in the top left-hand corner. In the next page, you will be prompted to enter the details of the Leave Balance. This includes the employee name, transaction date, leave type, hours and any comments. When you are done, hit 'Save the Leave Accrual' button at the top of the page. On the next page, you can click 'Info' on the left side to view additional information about the employee's Leave Balance, including the Record ID, Creator, the date it was created, and the date it was modified. To view the full list of Leave Balances, click 'Back to list' in the top left corner. From here, you can view leave balances, as well as print the list as a PDF or CSV file. If company policy dictates that employees can or cannot see their leave balance, we've made it easy to set this up within Deputy. 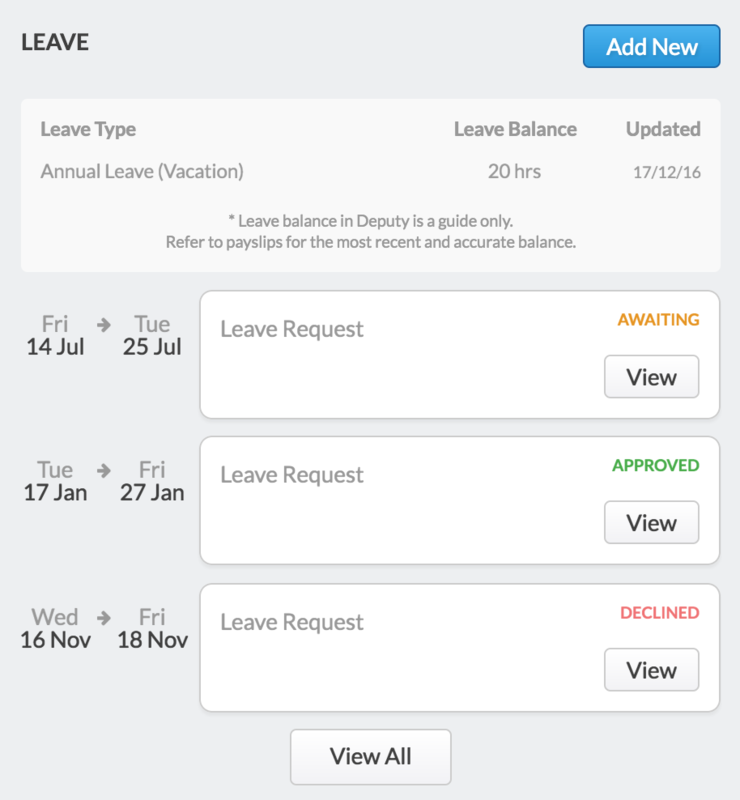 To allow your employees to view their Leave Balance, you must switch this on via a toggle. To do this, click the dropdown box in the top-right and select 'Global Settings'. 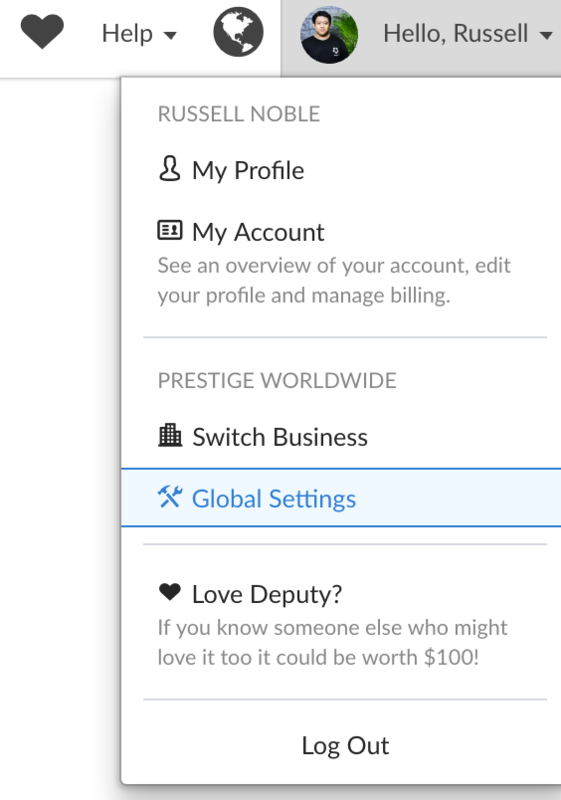 In the pop-up box, select the toggle displayed below based on your preferences. If you would like your employees to view Leave Balance in Deputy, switch this to 'ON'. If not, switch it to 'OFF'. To view your leave balance, you will need to check with the System Administrator to see if they have allowed this permission for employees. If they have, simply head to your profile by clicking the drop-down box in the top-right corner and selecting 'My Profile'. Scroll down to the 'Leave' section and you will be able to view your Leave Balance, including the type of leave. 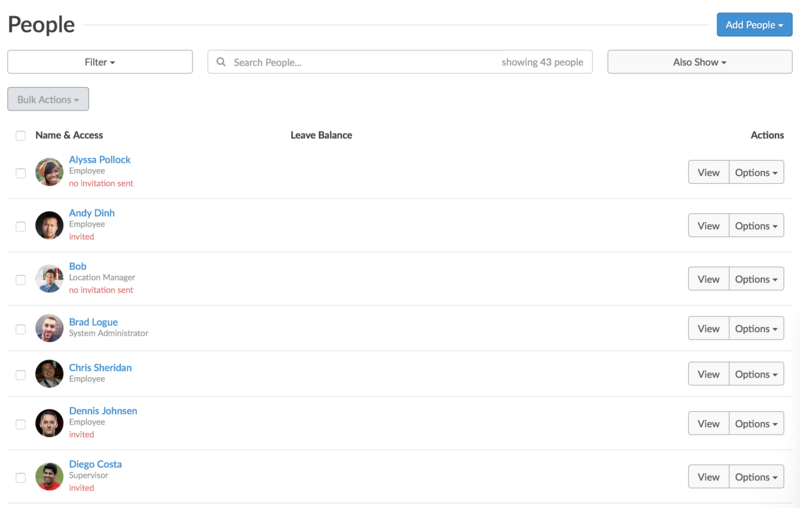 To view and filter leave balances, head to the People page. Under the 'Also Show' drop-down menu, check 'Leave Balance'. A new column will appear on the People page labeled 'Leave Balance'. To further filter employees by leave balance, click the 'Filter' drop-down menu. Under 'Leave Type', select the employees with the leave type that you would like to view. You will now view employees with this leave type recorded. This view will allow you to see your Leave Balance in hours, and in days. This is calculated based on the 'Default Shift Duration' as set in Location Settings. To edit this value, simply head to your Location Settings, and in the Scheduling tab, edit the 'Default Shift Duration (hours)' field. In the previous screenshot displaying Leave Balance, it displays 'Janek Brandenberger' and 'Mick Foley' with 4.67 and 2.35 days leave respectively, with the default shift duration set to 9 hours. After changing the default shift duration to 7.6 hours, you will see the Leave Balance calculate based on this new value. Janek now has 4.93 days, and Mick Foley will have 2.82 days of leave.